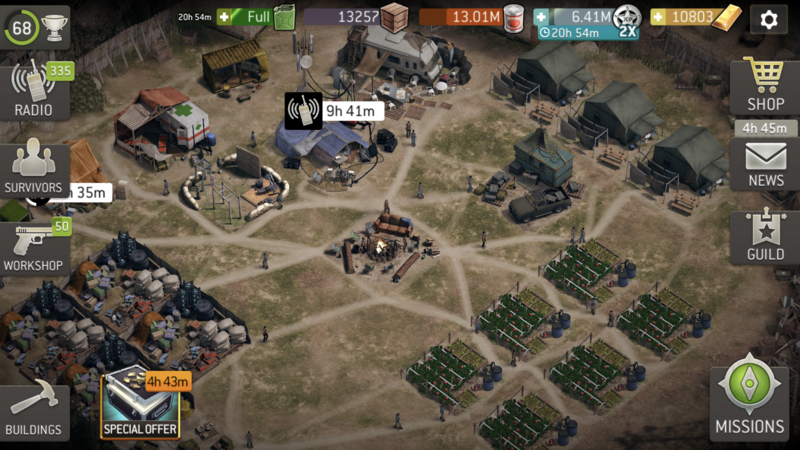 @Darylfan do you remember if you've setup your outpost? If not check your Outpost building to see what level it is, it should be level 5 if you've upgraded it. Leveling up the walkers doesn't affect player level. Thanks Zbot but its level 5. I was just wondering if I maxed out the walkers would that trigger another upgrade for the pit?? @Darylfan would you know what your building point (bp) is? It's on your profile. That might give a clue as to where your missing bp might be. If you have enough supplies you should see the green arrows on the building if an upgrade is possible. The next thing would be to list all the buildings and levels of the building you have. By any chance are you returning to the game after a break? There used to be bp discrepancy but that was fixed a few updates ago. And if all else fails, please contact support in game, click settings (gear icon), help, contact us. Support can take a look to see what's going on. I think if you'd pasted a screenshot of your camp here so all the buildings are visible, we might be able to get you quick response on what's going on. There's also an option that you've missed to build a building at all in the 1st place. Like scavenger on one of four supply storages or 1 of 3 XP tents or 1 of 6 farms. All good ideas I will post. I think my blg points are 1450 out of 2000. Darylfan, I am in the same situation you are in. I have supplies for upgrading, but there’s nothing I can upgrade. I have the same amount of points as you also. Any luck so far? Outpost? Radio Tower? Walker Pit? *if you post a screen shot of your camp it might be easier to find what's missing. I can't see but I suspect you have your walker pit upgrade, yes? Just double check to be sure. What I believe is that you're next available upgrade will be your Radio Tower but I don't think you have enough supplies yet. 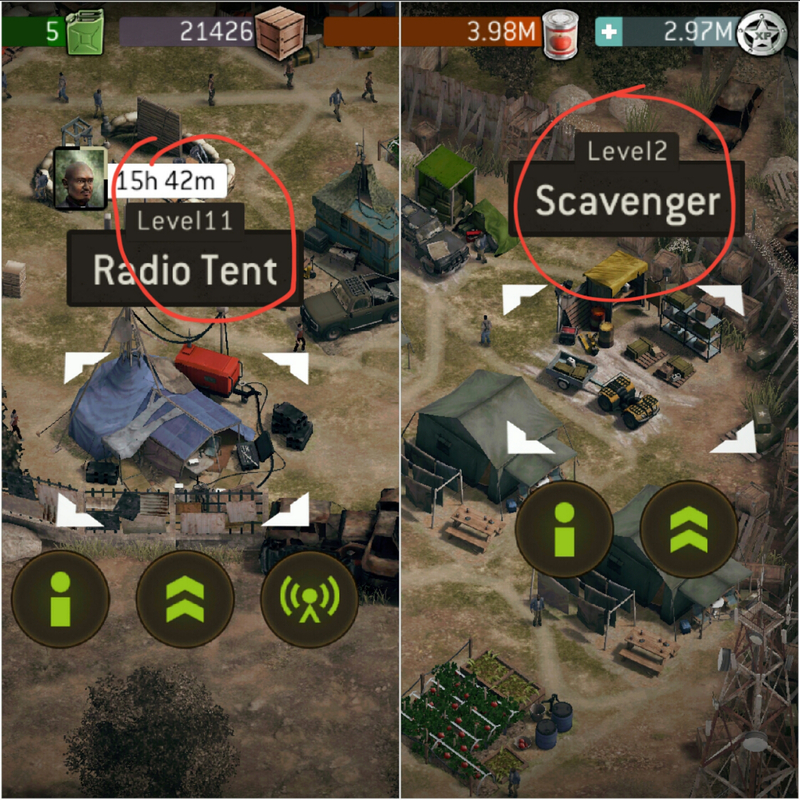 If you have upgraded everything then click the Radio Tower & it should show that it is upgradable, just when you have enough supplies. If I remember correctly it's about 18 million. It will show how much is required when you click on it. Check if that's what it is & feel free to ask anymore questions if needed. I or someone else will be happy to try to help. If all else fails contact support from within the game & they'll be able to look into your account to see what's going on. Best of luck & let us know how you go. Yes, walker pit is upgraded. I checked the radio tent and it says I am at max level 18. I guess I will gather more supplies and see if anything happens then. Thanks for your help! Your welcome. No problem at all. That's what the forum is for. There's always someone willing to help. I suspect that your Radio Tower is lvl10 which means it will be upgradable when you have enough supplies. Your Scavenge building should be at lvl2 like mine now. I thought I'd mention it so you can check. As I mentioned earlier you can always contact support from in game. Click on the cog wheel at top right of screen. They are always very helpful and will be able to check more than I can from here. There might be something I'm missing that they will be able to pick up. Anyone know if the Memorial Tent matters? Later players would not have had that building option, I think. @Artminius no memorial tent has no impact on it.